You’ve ordered a transcript on latakoo.com. Now you can use that transcript to locate key points in the video, download a text file, or grab an SRT file for captioning on social media. Every transcript is available in multiple formats, from .SRT files, which work for captioning on social media, to .SCC files, to plain text. After you locate your video, click Expand to view the video and access the transcript file. 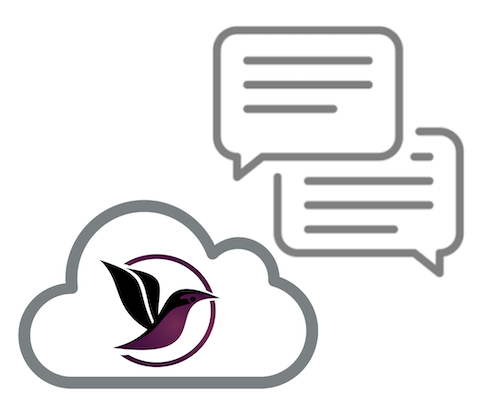 A transcription icon lets you know that a transcript has been ordered or processed. There’s a download button at the far right of the menu that will automatically download a .txt file. This file will contain timecode markers that start at 00.00.00. You can also send to the printer with the print icon. 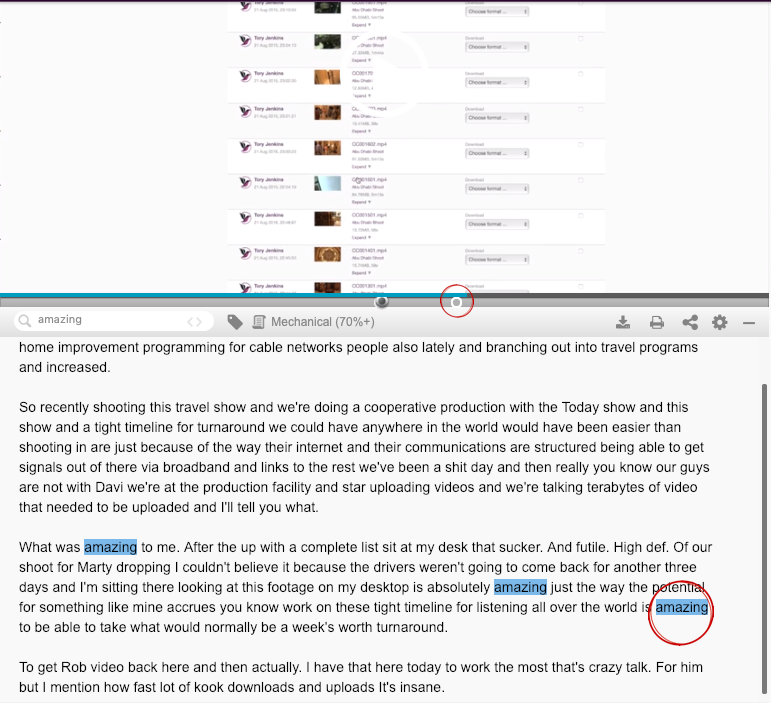 The “+” icon will expand the view the text of the transcript. Click on the menu “Download with run time” to reveal additional file formats. One of the most common types requested is .SRT, which is used for social media sites, such as Facebook and YouTube. You will need an open source SRT editor to make changes. Here’s one we use. 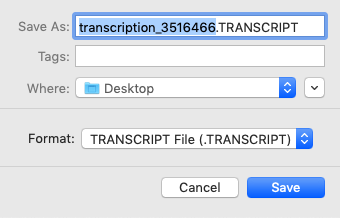 NOTE: The option marked “TRANSCRIPT” in this menu will download a text file. However, you will need to change the file extension from .transcript to .txt to open it. Selecting CTC under the menu titled “Download with Camera Time” generates a text file that preserves the time code from the camera, if it’s been maintained in the video file. The best way to ensure camera time code is preserved for transcription, is to upload files directly from the camera card. Drag the contents-level folder from a camera card into the latakoo Flight app, and the app will extract those video files into the window. Continue the upload process for individual files. Here’s more information on the folder structure for different camera types. Click “+” to expand the view to show the transcript for the video. 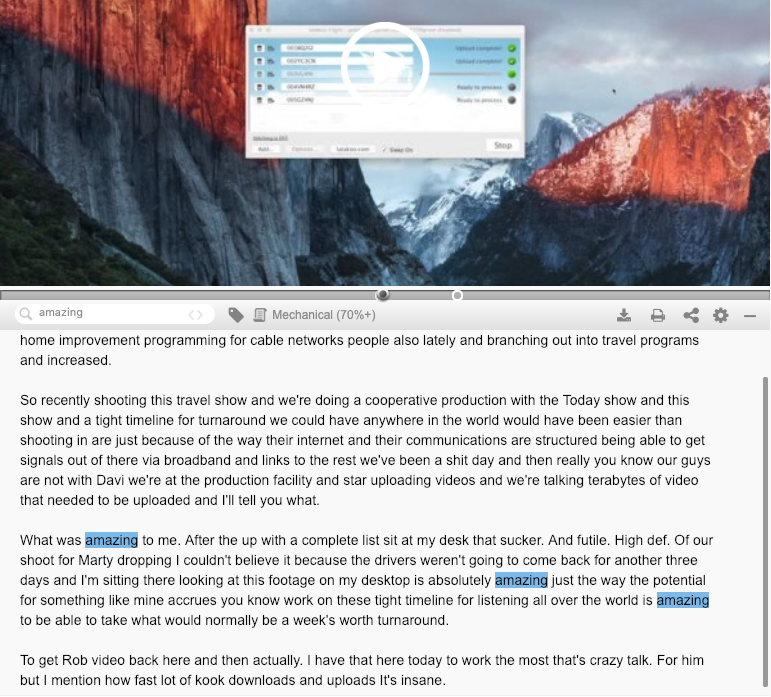 Use the search function to locate key words or phrases used in the video or interview. Click on the highlighted word or the marker in the timeline to jump to that section of video. This is a fast way to quickly review sound bites or select interview segments in the content creation process. How are you using latakoo transcription? Let us know by emailing our support team or tweeting us @latakoo.